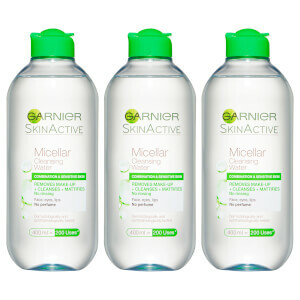 Calm and clarify your complexion with Garnier Micellar Gel Face Wash, a soothing cleanser created for Combination and Sensitive Skin types. Enriched with nourishing Grape Extract, the weightless gel formula melts into the skin to instantly replenish hydration, providing relief from irritation and restoring a healthy moisture balance. Expertly sweeping away dirt and impurities, the fragrance-free makeup remover leaves skin fresh, clean and visibly brightened. This is a 3 pack. Suitable for combination and sensitive skin types. Aplique no rosto húmido, no lavatório ou no duche. Faça espuma com água e massaje com movimentos circulares no rosto, concentrando-se nos lábios e na zona dos olhos. Enxague. Em caso de contacto direto com os olhos, lave-os imediatamente. 967118 2, Aqua / Water, Glycerin, PEG-200 Hydrogenated Glyceryl Palmate, Coco-Betaine, Sodium Laureth Sulfate, Polysorbate 20, PEG-7 Glyceryl Cocoate, Citric Acid, Cocamide Mea, PEG-55 Propylene Glycol Oleate, Polyquaternium-11, PPG-5-Ceteth-20, Propylene Glycol, Sodium Benzoate, Sodium Chloride, Sodium Hydroxide, Vitis Vinifera Fruit Water / Grape Fruit Water, Zinc PCA, (B190309/1).